If you’re going to have a garden, then you’re going to have to deal with weeds. There are all sorts of things you can do to minimise the problem but weeds tend to always find a way to poke their annoying little heads out. Having a garden is all about becoming a gardener. A truly beautiful garden is about the plants combined with the intention of the gardener. You have to love the whole process of planting, fertilising, pruning, watering and you have to learn that weeding is all part of that process. Good habits are important in all aspects of life and they’re especially important in gardening. 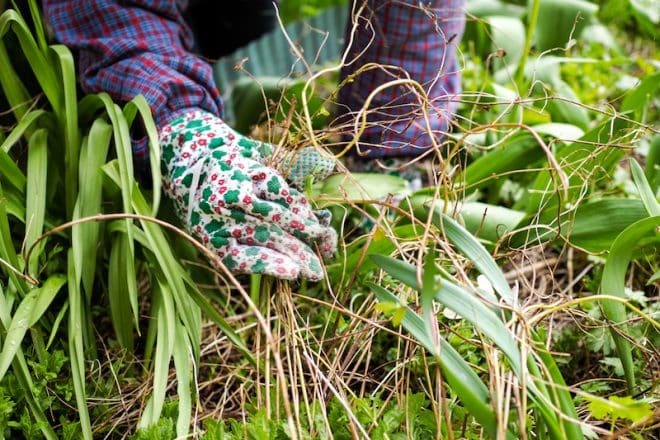 If you get into a habit of weeding your garden it will make the process a whole lot easier. Instead of spending four hours every couple of months it’s far better to spend 15 minutes or so every weekend pulling out the few weeds that have poked through. Simply using your own two hands can be quite effective, but having a few other items to call on will make your life a whole lot easier. Pulling out a weed with your hands will often only get rid of the top part of the weed, leaving all the nasty little roots behind, allowing the weed to grow back time and time again. Instead of just tugging at the plant, grab a claw, a shovel or hoe and dig the entire plant out – roots, vegetation and all. A claw is all you need for shallow-rooted weeds, for more hardy weeds use a hoe or a shovel and make sure you get the entire root out. Even though they seem like horrible aliens sent from outer space to ruin our gardens you have to remember that they are a natural form of flora that follows seasons just like every other type of flora. You need to get rid of the weeds before they start seeding and definitely before they start to flower. If you understand your seasons you can get rid of the weeds before they have reached the ability to multiply and that’s every gardeners dream. Creating a low-maintenance garden is all about working hard at the start. The more you weed in the beginning the better chance you give yourself of enjoying a low-maintenance garden later on. That’s because you can stop weeds from setting seeds all around your garden bed and digging the roots deep into your pride and joy. Is Your Garden a Weed-Friendly Zone? It’s no coincidence that weeds pop up exactly where you don’t want them, the open-plan garden bed, the beautiful patch of lawn or that pebbled run down the side of your house. The cycle of nature is all about filling space; if there are enough nutrients in an area plants will rush in and make use of those nutrients. If you want plenty of open space in your garden you have to expect to have more of a problem with weeds than someone who has gone for a more natural and rugged look. The more plants there are in an area the harder it will be for weeds to grow. The space you leave between your plants can have a direct bearing on how much weeding you will have to do. That’s not to say you can’t have your ultra modern, sparse garden it just means you have to get ready to do a little more weeding. Mulch is not only great for your plants it is also fantastic at making life difficult for weeds. Mulch deprives weeds of the light they need to grow and it also makes a great home for crickets that will eat all the seeds that weeds drop. Depriving weeds of water is an easy and effective way to kill and prevent weeds form germinating. The best way to do this is to beneath mulched areas so you provide your plants with water and keep the weeds thirsty. All of these tips will help to make life easier but the most important thing is to change your mindset and make weeding a part of enjoying a beautiful garden. So stop moaning to your family about having to do the wedding, roll your sleeves up and get it done – or cover you backyard in concrete, it’s up to you.